When it comes to getting reviews, you want to listen to someone who has experience and can guide you through this specialized—yet significant area of publicity for your book. Let’s face it, customers (your readers) make buying decisions every day 24/7 on the basis of customer reviews. I’ve been writing reviews for print and online publications for years. In fact, I’ve written more than 450 customer reviews on Amazon. 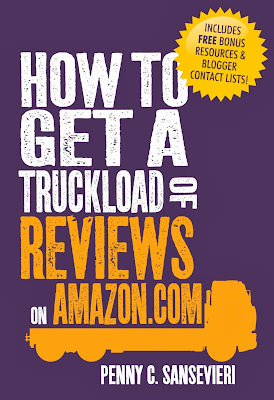 Even with my extensive background, I learned a tremendous amount of insights throughout HOW TO GET REVIEWS BY THE TRUCKLOAD ON AMAZON. Penny Sansevieri knows her stuff—not only for marketing her own books but she has successfully helped many authors through her PR business. She takes this experience and pours the details into this valuable resource. Every author needs to get this book and read with your yellow highlighter. Then go back through and take action on the various suggestions. You can read this book multiple times and follow the links and resources. In the opening, Sansevieri includes this guarantee, “let me make you a promise as a person who’s been marketing for many, many years. This book works. I guarantee it. If the methods in this book don’t get you more reviews, more exposure and more sales, you can return it to me, personally for a full refund.” Now when do you see that promise in a book? Rarely. The examples and how-to information make this book a “must have” for any author. Whether your book is brand new or has been out for several years and you want to give it a new blast of promotion. Use the advice in Sansevieri’s book. Getting reviews by the truckload is not magic or something that happens without work. It will involve personal and consistent effort from you. I highly recommend HOW TO GET REVIEWS BY THE TRUCKLOAD ON AMAZON. In fact, I’m going to take action on a number of things that I learned reading this resource for my books.